This photo has got 2 killer whales on it that look like they are on their way to somewhere to eat. 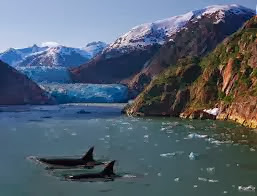 I think what makes this photo unique is that the killer whales are there because you can have a photo of mountains and water but it is even awesomer because of the whales. This photo makes me feel relaxed and like I can just do nothing forever.